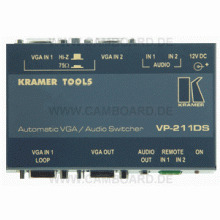 The Kramer VP-24 is a high quality Presentation Switcher / Scaler designed for a wide variety of presentation and multimedia applications. In one high performance unit, it combines the functions of a 4x1 switcher for composite video and audio, a 4x1 switcher for s-Video and audio, and a 4x1 switcher for VGA-type signals with audio. 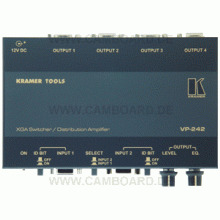 The VP-24 is designed to be a one-box solution for installations that would otherwise require several separate products. 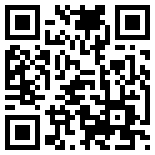 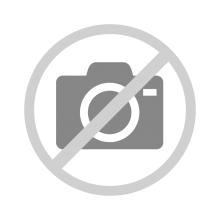 Each section can be controlled independently from the others. 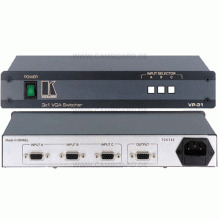 When the machine is switched to SCALER mode, any selected input is outputted via a HD-15F connector, scaling the composite and YC inputs to VGA/SVGA. 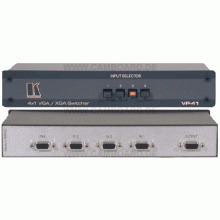 The graphics input is routed as-is to the scaled output. 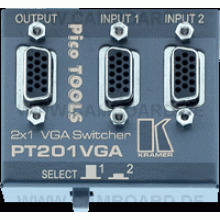 The VP-24 is controlled by front panel buttons or by RS-232 serial commands transmitted by a touch screen system, personal computer, or other serial controller. 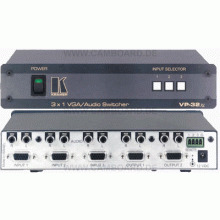 The VP-24 has an additional audio switching section which routes one of the pre-selected audio inputs from the other switching sections to a separate output. 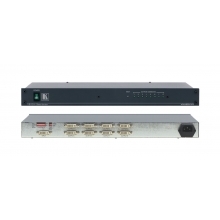 This switching section can insert an additional microphone channel - either by switching, mixing or talk-over. 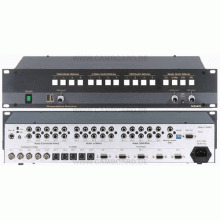 The machine allows changing the master audio output levels by RS-232 commands. 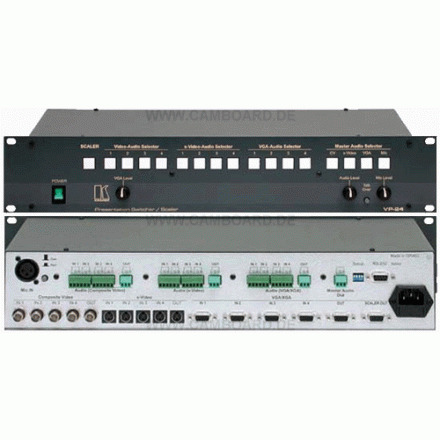 Front-panel controls allow adjustment of VGA/XGA output level, and EQ., Master audio output level and Microphone level.